Special thanks to New Midland Court for extending this food review invitation. 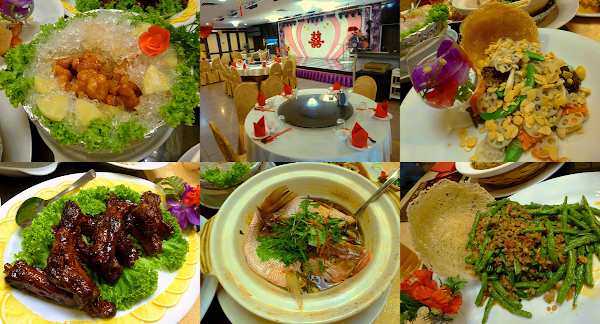 New Midland Court Restaurant (新美兰阁海鲜酒楼) is a Chinese restaurant at Level 3 of Midlands 1-Stop. Since my previous visit, the restaurant has been taken over by a new owner, hence the change of restaurant's name. The new management has renovated the restaurant extensively. Fancy chandeliers hanging from the ceiling provide a certain degree of luxury. There is also a small stage at the front for people to give toast during wedding events. At full capacity, New Midland Court is able to accommodate up to 50 tables at a time. There are also private dining rooms within the main dining area and along the outside corridor. Karaoke equipment is provided in each room. With a new kitchen crew, the menu has also been revised with contemporary elements of Chinese cuisine. The restaurant also has a reasonable stock of live seafood for customers' pleasure. Chilled Sweet & Sour Pork (冰镇咕佬肉) reflects the modernist approach taken by the chef. Instead of serving hot, sweet & sour pork (咕佬肉) is chilled in a pot of ice. Although the pork's flavor is similar to its usual counterpart, the mouthfeel is significantly different because the meat is slightly icy. I recommend this dish especially if you have not tried it before. Teriyaki Pork Ribs (日式一枝骨) are glazed with sweet-savory sauce and then roasted to perfection. Although several pieces are quite thick, I am surprised that savoriness extends all the way down to the bones. Eaten directly, the pork ribs are too salty for comfort. Therefore, they are better enjoyed with rice. As for seafood, Claypot Red Snapper (生煲红狮) is braised in a special blend of sauce, then served in a claypot for presentation purpose. The red snapper is fresh indeed, but I think there is room for improvement in terms of how to integrate the flesh with the gravy. Taking a detour to a dish with lighter taste, Almond & Assorted Vegetables (杏仁四宝蔬) is an interesting dish indeed. Comprising of 4 vegetables (namely lotus root, snow pea, carrots, apricot kernels, shimeji mushrooms) and almond flakes, this wok-fried dish is juicy and satisfying in every mouth. Traditional Tiger Prawns In Claypot (古法大明虾煲) is served in a claypot filled with mildly-spicy gravy and glass noodle (冬粉). The shrimps are definitely fresh, as evident by their crunchy texture. In addition, glass noodle takes advantage of the well-balanced flavor of the gravy. Seafood Tofu (海鲜豆腐) is topped with button mushrooms, shimeji mushrooms, shrimps, bell pepper and fried garlic, then flavored with oyster sauce. This soft bean curd dish is suitable for people with lighter palate. As for Sichuanese Stir-Fried String Beans (四川四季豆), I like the naturally sweet taste of the beans. On the other hand, I feel that the amount of dried shrimps is too much, resulting in excessive saltiness even when eaten with rice. One of my favorite dishes here is Pumpkin Tofu (金瓜豆腐). The yellowish emulsion of pumpkin paste is creamy and carries graceful sweetness. Meanwhile, the soft bean curd is filled with minced pork and shrimps. Overall, I find this dish to be truly satisfying. It is highly recommended. Directions: New Midland Court Restaurant is located at Level 3 of Midlands 1-Stop. There are ample of parking spaces at the basement.